Words on Wednesday- We have Amazing Friends! Actually they came last week, but Jen wasn’t able to get to the post box until this week. 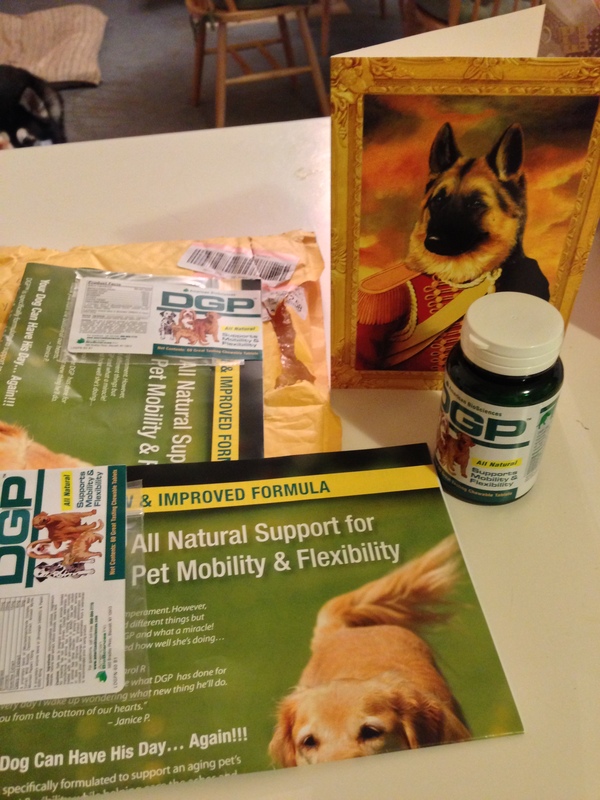 BJ Pup sent DeDe a bottle of the joint support supplement he uses. I can’t wait until it works its magic and makes DeDe feel better! Thank you so much BJ!!! 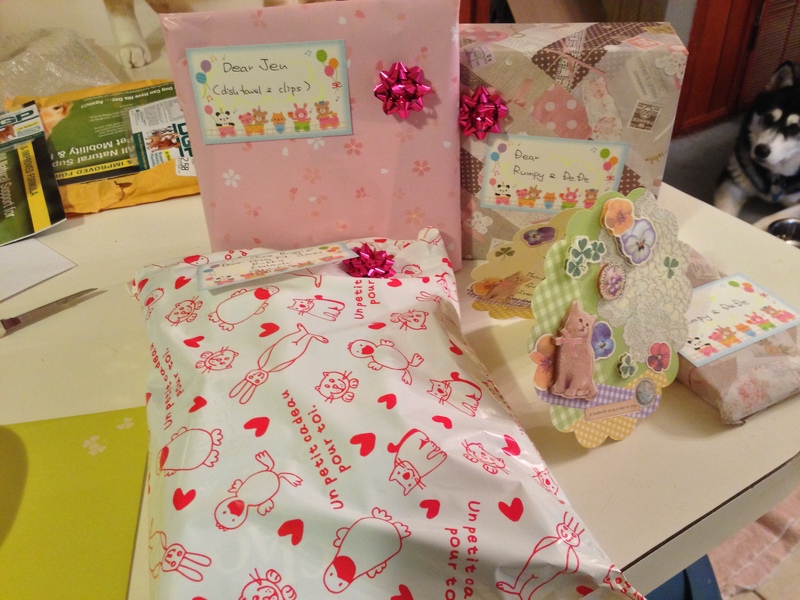 And our friend Kevin Watanabe sent a package with something for each of us! Kevin sent me cookies! And doggie cheese! Oh I love them! Yes, Kevin, I do share! And he sent treats for the kitties! And look what he sent to Jen! 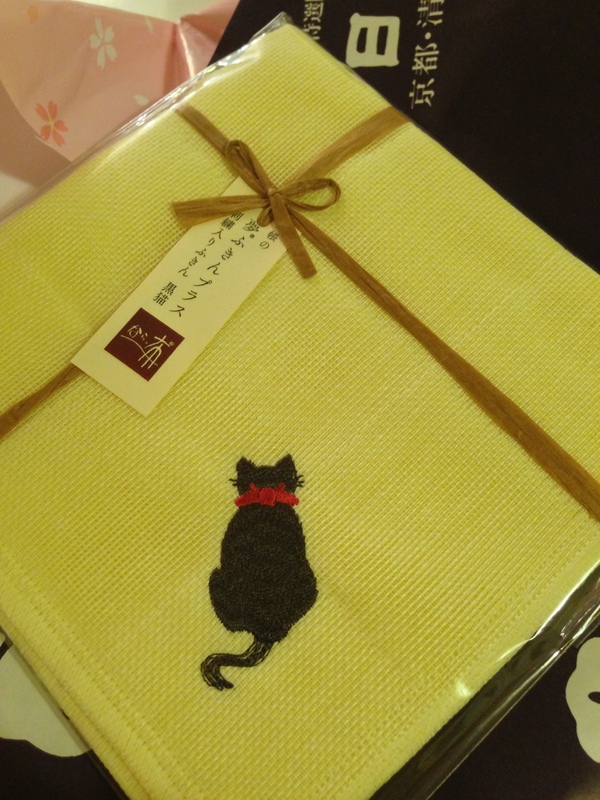 Isn’t this towel just adorable? I have such amazing friends! Speaking of amazing friends, I’m asking you to nominate two of my amazing blogging friends for a Petties Award. The Creative Cat is my choice for Best Cat Blog. Animal Shelter Volunteer is my choice for Best Cause Blog. Will you consider nominating them as well? Thank you! Hi Jen, Rumpy and your furry friends – thanks to you I have discovered the wonderful blog that is The Creative Cat. It is amazing and I have nominated it for the Petties Award. Thanks so much for directing me there. Aren’t your friends so lovely – you all thoroughly deserve your presents – I hope DeDe is feeling better – such a sweet dog! Wow! Good for you guys! I’m so happy with you – I will cross my paws that it works for DeDe. YAY – so happy for Jen. We’ll be even happier it works as it is it supposed to work! You are a very lucky dog indeed Rumpy and the rest of the family by association! Do hope DeDe benefits from the supplement quickly. Those are pawsome gifts!! You do have amazing friends! Did you have a birthday, Rumpy? Woooo, Rumpy what wonderful prizes! I nominated Animal Shelter Volunteer for a Pettie as well…forgot about The Creative Cat though so thanks for the heads up! DOGGIE ONLY CHEESE….. you mean that you won’t have to share it with the peeps or anything? WOW… THAT is a super pressie package fur SURE. It feels nice to have you thinking of me as your friend. I was happy to send supplements to DeDe. We have to help one another. I hope they work for her; they worked for me. I think of you, DeDe, June Buggie and her brood, and Jen as my friends. Yay! I love to have friends!!!! I can’t find The Creative Cat on the Petties page! You will have to nominate them. The blogs that are listed are from last year. Click on the nomination button and type that blog in for Best Cat Blog. The writer is Bernadette Kazmarski. And how nice and thoughtful of Kevin Watanabe to send you all those terrific presents. He’s a great guy! We really like that towel, too, by the way. Thank you again for asking your friends to nominate us for the Petties. If we are a finalists, it will be because of your efforts and thoughtfulness. Big hugs to you all, dear pals. I sure hope you are a finalist… and then a winner! woo woo woo! Awesome bling! I LOVE the towel! I wish I could take a nap on it!